I have NOT been disappointed. WAR succeeds on every point for me. Is the game perfect? No, but nothing is. The points I mentioned above are the core of the game for me, so as long as those hold true I will be happy. The forest is looking great. I am not worried about each individual tree. More details coming soon! 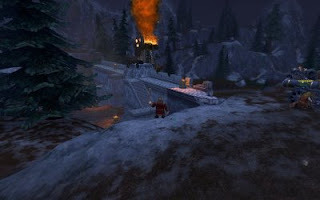 Below is a screenshot of me watching for Greenskin infiltrators in the Tier 1 Dwarf RvR area. Click it for a better view.